This program allows you to easily save an average of 20% off prescription medicines. (Save the most on generic medicines.) This is NOT insurance. Rather, it is a way for you to get discounted pricing on commonly used prescription medicines at participating retail pharmacies nationwide. This means you are assured the lowest price in that store, at the time you purchase the medicine. 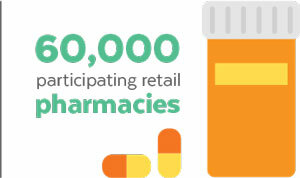 The CVS Caremark contracted drug discount network extends across the United States and consists of more than 60,000 participating retail pharmacies. CVS Caremark provides excellent national and regional coverage by offering a large and stable pharmacy network with proven accessibility. Visit www.cvshdrx.com to locate participating pharmacies and access the online drug pricing tool. The drug pricing tool will assist you in anticipating your potential drug costs. The CVS Caremark retail pharmacy network pharmacists are aware of the discount rates CVS Caremark offers and have agreed voluntarily to participate in the discount program, since it helps increase total sales volume within their stores. And CVS Caremark provides a Pharmacy Help Desk to answer questions from participating pharmacists.